Located about 20 minutes drive from Ubud. 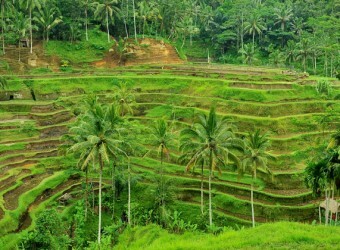 Tegal Lalang is a natural place, one of a superb view and the most stunning scenery of the terraced rice fields. Once you go into the place, there is green rice field view in front and you are healed by nature. Enjoy tasty lunch and tea time with fresh air surrounded by the green view. Unfortunately there are many souvenirs vendors selling their souvenirs to tourists but I felt relaxed when viewing the rice terrace scenery. It is a rally beautiful place. It is great to view the scenery while having a cup of tea at the café in the rice field area.